appears in the most unexpected place. After you have conditioned your spectators by repeating the effect twice, you get ready for the unbelievable climax. 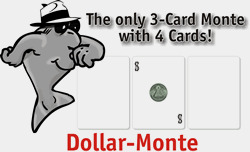 Suddenly, you show three money cards and only one blank card. The four cards may be examined at the end!